This 4Shared review was last updated July 13th, 2016. 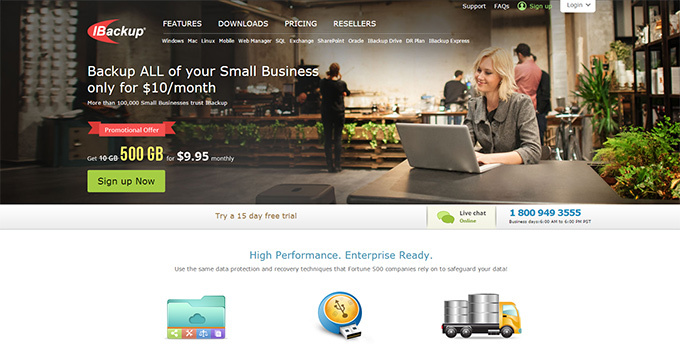 4Shared is an online cloud storage company that has been around since 2005. Mainly focusing on file to file transfers online, their simple and basic service has become a trusted name that even the greenest users can quickly pick up and use. They place their focus on simplicity, coupled with easy drag and drop uploads for basic and easy to use file sharing and backup capabilities. Their primary focus may not be backups, but it offers all the rudimentary features to use it as so. Simplicity is a recurring theme when it comes to 4Shared’s paid plans. You can use their free plan which is a good idea if you want to try out their service and see if it suits your requirements. While it does not offer password protection and premium features, 15GB of free space is offered. It should be noted that free accounts will automatically delete all your files after 180 days of inactivity. Free users are limited to 2GB file size limits, and would need to be split before uploading. Paid Premium plan users benefit from 100GB of space, SSL encryption, direct download links with password protection, backup and restore deleted files, and an ad free experience. File size limit is also increased to 5GB. Discounts are offered on the monthly rate when opting for 3, 6 or 12 month plans, bringing the cost as low as $6.50 USD per month. Being an early cloud storage provider, they have always been appreciated for the simple drag and drop upload interface. Software is available for all mobile platforms including Apple, Android, Windows and older Nokia and BlackBerry devices. Desktop support is available for Apple, Windows and Linux. Another benefit is 4Shared’s simple web interface; regardless of whether you have an account or not, you can quickly upload files such as videos and photos or music. Its overriding feature is simplicity in pretty much every aspect you can imagine; from signup to easy sharing of links with friends. Premium plan users can zip files directly on the cloud. They also provide FTP access for the techies, but in all seriousness, I highly suggest that all users get a feel for FTP (File Transfer Protocol) software, as it can be extremely useful and time saving for queuing backups, downloads and transfers in a much more efficient way than using software provided by the cloud hosting service. 4Shared’s name is not accidental, and the service allows you to quickly upload and share files without any fuss. Becoming a member provides much better sharing options while marrying cloud storage backups under one roof. Sharing an uploaded file is done through sharing links readily available for you to email or copy. You can quickly share links with other 4Shared members internally as well. There are no bandwidth usage limits, so you can share and download as much as you want. Just about any type of file can be shared, from pictures, videos, music, or work documents between team members and employees. Premium users can password protect files and folders to protect from unauthorized access. The interface allows for quick creation of photo albums and matching thumbnails for easy browsing. Sharing your photo albums with friends and family is very easy, and provides the same thumbnail interface for others to enjoy. Just drag and drop your pictures for each album you wish to create, and once all the thumbnails are populated, you can re-name and edit files to your liking. You can even create a public online album to share on their community with the rest of the world, while also providing you an array of music and entertainment to be discovered from other contributors. Video and music files can be streamed directly from the cloud as quickly as with 1 click. Simply locate the file and click the ‘Stream media file’ icon next to it. An extra preview window will pop-up and start to play. Playlists and and queue capabilities for a better streaming experience are available on Android and desktop, but still lack better functionality on other mobile platforms. One cool feature is that community sharing also works for video and music, allowing you to share any audio and video content with all users. 4Shared outlines their security as being a very important focus of their cloud storage service. All files are automatically and regularly scanned for any possible viruses and malware, keeping you safe with up to date definitions at all times. Not much is explained regarding encryption, other than utilizing 128-bit encryption for confidential data such as usernames and passwords. As mentioned, folders can also be password protected for private access, and you can choose to exclude your public folders from being indexed on Google or other search engines. Files can also be made completely private and accessible only to the publisher. Customer data is protected behind multiple firewalls effectively cutting access from the internet. Access to server databases is limited to security personnel, while their data centers follow the highest security codes and surveillance systems. Databases are backed up on a regular bases and premium members will have all data backed up for the duration of their account, as well as up to one year after closing it, allowing them to request for data recovery anytime shortly after cancelling service. To get all the details, visit their Security Overview page. I did really like the login system with 4Shared and their links to social media, and the speed of their service was acceptable. I tested on my ADSL line with 5Mbps download and 1Mbps upload bandwidth by transferring a 135MB video file. The transfer completed within 25 minutes, which isn’t as terrible as it sounds when you remember my Internet connection is a far cry from a gigabit line. I wouldn’t say that they’re an industry leader when it comes to the speed of their service, but by and large, it will work fine for most people. Backup wise 4Shared covers premium users by allowing them to create basic backups as well as recover any accidentally deleted files in the trash for a period of 24 hours. To utilize the backup service, simply install the software and add the desired files to My 4Shared folder or other folders of your choice to the 4Shared Sync list. Servers are constantly backed up to ensure that no data loss occurs. Even after you close your premium account, you can still request to recover old files for up to one year past your cancellation. However, the service is very basic and does not provide any advanced backup features with scheduling from your own devices. Data restore capabilities remain basic as mentioned above. Free users can rest assured the same security precautions are applied to all customer data, but only premium paid users will have the benefit of synchronizing local folders for automatic backups, recovering deleted files, as well as having an extra year of backed up data after closing down services. Once more, the service does not offer advanced functionality in this domain, but provides a simple and functional backup solution that works. One of 4Shared’s major benefits is the fact they offer 24 / 7 support for all their users. Their support page breaks down simply and allows you to access certain areas that break down into upload and sharing, they also offer support with their mobile apps. All of these benefits provide great and simple solutions to most of the common problems you may encounter. They also have a very extensive FAQ page to answer almost any question you may have. 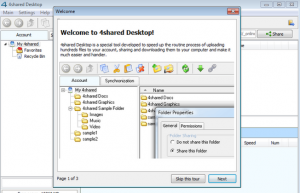 4Shared’s easy file sharing and quick drag and drop design allows for simplicity and rapidity. The platform supports basic backing up and restoring files when needed, providing rudimentary data storage capabilities. Photo albums are easy to create and share with family in minutes. Their desktop and mobile applications are also incredibly simple to use, and allow access from just about any device. Other benefits include file management functions, secure FTP access, and direct streaming from the cloud. However, overall pricing and storage capabilities lack when compared to some top competitors in the data storage field, leaving 4Shared a little behind on storage space, file size, and advanced capabilities.